I am going to be honest with you – In last 2 years, I have not bought a single Music / Movie CD or DVD. I either watch it in the theatre or stream it online. In recent times, Increasingly, I see myself shifting to streaming / renting it online. In addition, there is always an option for me to watch pay per view through my satellite cable provider. The point I am trying to make here is that very few people now-a-days buy a DVD or a CD to watch movies (atleast in my opinion), unless it is a classic or a rare one which generally you may not find online. However, MoserBaer, a leading CDs / DVDs manufacturer based out of Delhi thinks otherwise. 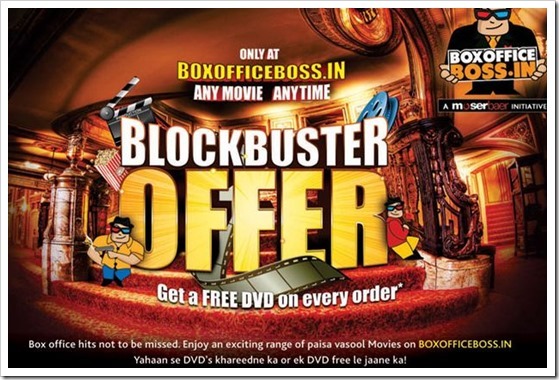 They have recently launched Boxofficeboss.in, an online shop where you can order CD, DVD or Blue-Ray movie titles. Talking about the site itself, it has a good collection of Bollywood, Hollywood and even local language VCDs and DVDs and price range of these movie titles range from Rs. 299 to Rs. 1499 (for Blue-Ray). The site also offers pre-order facility for movie titles that are yet to be released on DVDs. Overall, it is a good site if someone is interested in buying a movie DVD online. The Real Question – Is There A Market For It Anymore? Though the site is good, the real question to be asked is – Is there a market for online CD, DVD buying anymore. Now, Here are the various cheaper and easier alternatives user has before he thinks of Buying a DVD. Please note, we are not including option of downloading torrents of movies and watching it free, though if you consider that option, everything else becomes expensive. So, here are options I will look at before buying a DVD! Is it available on my Pay-Per-View basket of DTH provider – Generally that costs around Rs. 50. Is it available on Youtube Movies or Yahoo movies free of cost. Yeah, many popular movies are offered on these or similar video platforms. Is it available on rent on Google Play Store or other similar stores. Here for Rs. 50 rental, one can watch streaming movie over a period of one month. So, if I have exhausted all the 4 options above (not including torrent), then buying a DVD movie makes sense. DVD collectors out there, don’t bash me up for stating the obvious. You guys are a dying breed. Times are changing and so are people. I think Mosebaer needs to consider this before spending huge budgets marketing this platform. I’m Seeling this as Flipkart Flyte. It would soon Shut down. There’s no market for Original movies.